Ethiopia's Prime Minister has warned people protesting in the Oromia state that the government will use force to quell demonstrations. 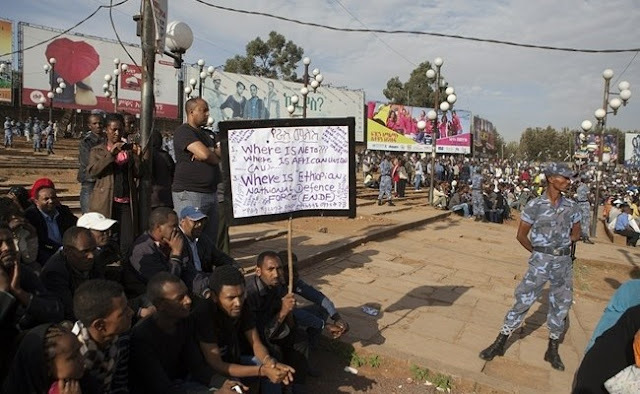 Protests started in November over fears of land grabs and forced evictions following the government's decision to expand the capital, Addis Ababa. Activists allege between 40 and 60 people have been killed by security forces during the demonstrations, but the government denied the claims and said only five people were killed. Hailemariam Desalegn alleged a violent mindset was behind the protests. He said in a statement: "We know destructive forces are masterminding the violence from the forefront and from behind and they have burnt down a number of government and people's property. "We have also seen that armed forces have killed and injured security forces and members of the public. This thing cannot continue like this. I would like to pass a message that we, in conjunction with the public, will take merciless legitimate action against any force bent on destabilising the area." Abiy Berhane, minister counsellor at the Embassy of Ethiopia in London, alleged that protests against the Addis Ababa Integrated Master Plan are just a pretext for people to create instability. He told IBTimes UK: "The violence in some parts of Oromia region is instigated by foreign-based opposition groups who are determined to overthrow the constitutional order in Ethiopia by the use of force. "They are using the Addis Ababa Integrated Master Plan as a pretext to advance their agenda of inciting violence aimed at creating chaos and instability in the country." However, Oromos – Ethiopia's largest ethnic gorup – have claimed forced evictions to allow authorities to build roads and infrastructures. As a result, Oromo people lose their livelihoods and become poor. Demonstrators also argued that forced evictions – as well as a perceived marginalisation by the government – threaten the survival of their culture and language. Etana Habte Dinka, an author and PhD candidate at Soas University in London, told IBTimes UK: "The government is trying to label this huge Oromo movement as a inter-ethnic conflict. From our experience with the ruling coalition, the Ethiopian People's Revolutionary Democratic Front, this is a very old strategy and it causes inter-ethnic conflict within different groups in Ethiopia. "The government's bloody crackdown has reached over 60 people so far, but we have only evidence of 40 people being killed at the moment." Berhane denied Oromos were being evicted and said the purpose of the master plan was to ensure development continues in the areas adjacent to the capital.